When winter comes, the ponds and marshes of the northland freeze over, sealing off the prime food source for many animals, especially the moose. However, the abundance of the boreal wetlands in summer enables the wintering animals to put on weight, storing up energy for the ensuing winter. The best food source in the frozen land is the twigs and bark of various shrubs. This moose has been browsing his way through a willow swamp. The gentle snow of the night before has settled on every little twig. 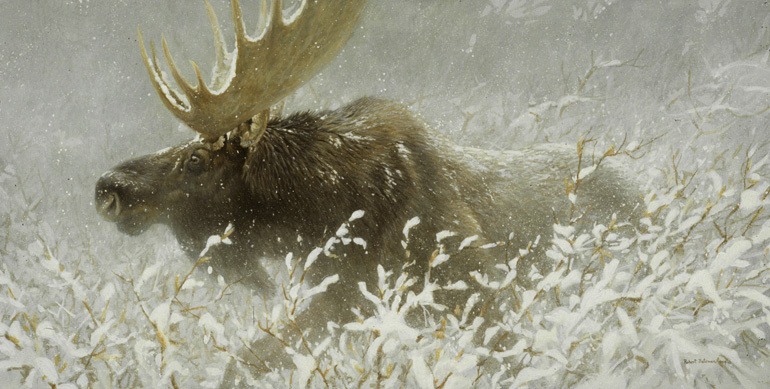 In fact, a few flakes are still falling, creating a counterpoint of delicate white tracery against the powerful planes of the moose's form. The tranquility of this scene is short-lived, however. For some reason, the bull moose decides to charge in my direction. At the very last moment he veers off, giving me a baleful glance as he thunders past.